Do you want to engage with a design professional that also controls all phases of the implementation with the intimate knowledge of the design evolution and the homeowners? If so, with the obvious benefits attendant thereto, look no further than working with our firm of design professionals, skilled artisans and project managers who maintain total control of all phases from the design concept through the project completion – and beyond. 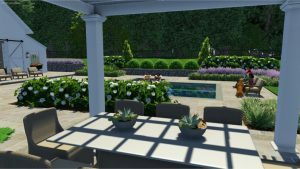 Our strategic, three phase program of planning, designing and implementing is the hallmark of IVY Studio, a landscape design and build firm based in the metro Boston area. We offer creative design solutions with qualified skilled artisans who implement the design with specificity of detail and management oversite to guarantee timely on budget installation with standards that are carved in granite and are unique as your individual fingerprint. Contact us at 781-591-0300 or vern@ivystudioMA.com to explore the opportunities we can offer you and your property.